we were so excited to crawl into bed. 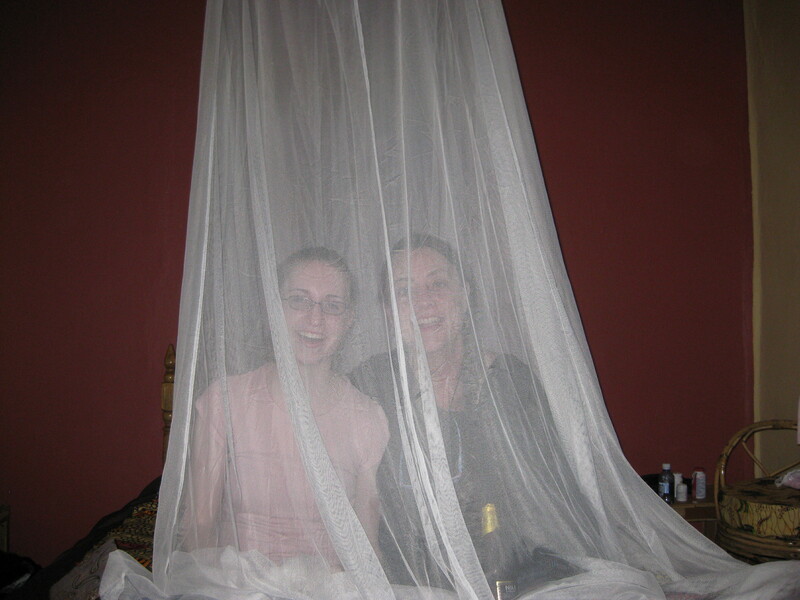 Especially a bed that was covered in mosquito netting. We spent our first full day with our first subject, Letha Sandison, who took us around town to show us her daily hotspots. We went to the local university and toured the art department, which was surprisingly large and budding with students, despite the lack of job prospects for art students here – a problem that Letha is working to counteract by collaborating with local artists for her various projects with Wrap Up Africa. We got to meet some of these artists – Bruno, an incredible potter and painter, whose studio is filled with beautiful hand-painted vases; and Sega, a gifted metal craftsman who has made uniquely shaped bronze buttons for Letha’s clothing. Both were very welcoming, and we’ll be returning to their studios on Saturday to film them working on their crafts. and filming them working on their textiles. I’m looking forward to talking more with the staff and hearing their stories. I had some interesting animals sightings today. The first thing I saw when I walked out of our room this morning was a gigantic pig. I kid you not – it was huge and it was standing right outside our building. Later, at Letha’s house, we met her “house duck,” Donald, sitting on their coffee table – it really is a duck that mainly lives inside! And when we got back to the hostel, I saw a pack of baby goats grazing outside our window. And that’s just right outside the capital city! I can’t wait ‘til our “Big Five” safari, where we’re sure to see some amazing animals in the wild. English is the national language in Uganda. Who knew! Although that doesn’t mean that absolutely everyone speaks it – there are dozens of tribal languages spoken as well, including Ugandan. Ugandans drive on the left side of the road. I guess it’s not that surprising it was a British commonwealth, but I didn’t know that either. Tomorrow brings new adventures – I’m excited to learn more about Wrap Up Africa! This entry was posted in People Making a Difference, Travel and tagged adventure, around the world, artists, documentary, exploration, extraordinary people, helping others, Letha Sandison, People Making a Difference, round the world travel, Travel, traveling abroad, Uganda, Wrap Up Africa. Bookmark the permalink. I want a pet duck!